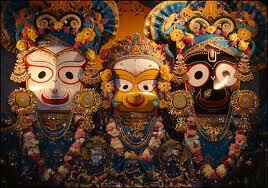 The festival honors the Lord Jagannath’s visit along with his siblings to the temple of Queen Gundicha. The caravan of Lord Jagannath, on the way, stops at their maternal aunt’s place – mausima temple – to take the meal of sweet pan cakes, Jagannath’s favorite dish as said. During his journey, Lord Jagannath is accompanied also by the celestial wheel called Sudarshan Chakra. Jagannath Puri temple is called ‘Yamanika Tirtha’ where, according to the Hindu beliefs, the power of ‘Yama’, the god of death has been nullified in Puri due to the presence of Lord Jagannath, popularly known as Lord Krishna, and his siblings , lord Balbhadra and deity Shubhadra ,in the Jagannath Puri temple. As many as three new splendid chariots are created for the Puri Yatra (the journey) of the Gods ,Lord Jagannath and his siblings , every year. The carpenters, having rights for this job by heredity, follow century old styles, written in the holy Hindu text, for building and decorating the chariots. Then comes the graceful day of Yatra, when these 45-feet high idols are pulled by millions of devotees came here from all over the world. The act of pulling the Rath by the ropes duringRath Yatra Puri is believed to be an extremely religious act, the belief which attracts millions of tourists from all over the world. The day of the Rath Yatra in Puri is the only day in the whole year when the non Hindu devotees can have an opportunity to see the gods and goddess of Jagannath Puri temple. All for the convenience of devotees, Puri Rath Yatra Festival Tour is largely organized in the country and, every year, tourists from home country or abroad take part in Rath Yatra Tour, with full of zeal. Apart from Indian, this festival attracts a large number of international tourists in Puri. The ISKCON foundation gets the credit for taking this grand celebration to an international level. 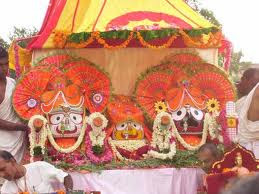 Puri Rath Yatra 2012 is due on 21st June, Tuesday. In a bid of making a huge turnover, tour operators in the country are providing variety of packages for this much-awaited celebration in Puri. You can capitalize on this golden opportunity and have a glimpse of the legendary celebration. You can enjoy the Rath Jatra Tour as an experience for the lifetime. So don’t waste time in thinking and go for it. Get your bookings done and see the elegance of thePuri Rath Yatra 2012.